This week, Prime Minister’s Questions centred around the government’s fraught Brexit intra-cabinet negotiations. 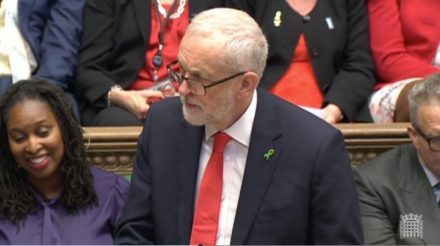 Jeremy Corbyn successfully probed the Prime Minister with a string of powerful questions on both the progress of the negotiations and the impact that the government’s chaotic incompetence will have on working people. Corbyn began by quoting the Theresa May’s desire for a frictionless Brexit negotiation process. “When the Prime Minister wrote at the weekend that she wanted ‘as little friction as possible’, was she talking about EU trade or the next cabinet meeting?” We’re all wondering how the government can expect to come to an agreement with its EU colleagues when it fails to come to an internal agreement. The Labour leader insisted that without a strong, coherent plan from the government, any attempt at negotiation will ultimately fail, especially with the dawning reality that “deadlines are at risk of not being met”. The Prime Minister skirted around the question and tried to force Corbyn to rule out a second referendum on the Brexit deal instead. But as he pointed out, “they’re no nearer to agreeing a white paper than they are on the strategy for going forward”. Corbyn also pressed the Prime Minister on the future of jobs in the UK, citing Airbus’ recent announcement that the business, which employs 15,000 British workers, may leave the UK unless a clear Brexit strategy emerges. Yet again, the Prime Minister refused to answer the question, choosing to focus on Labour and Corbyn with no mention of jobs or employment security post-Brexit at all. Corbyn gave a passionate performance as he highlighted the damage caused by “record numbers of zero-hours contracts” and rising levels of poverty. How many additional HMRC staff had been recruited for Brexit preparations, he asked. No answer from the Prime Minister. But there are just 10 months of negotiations to go, he pointed out, and “the government is in complete disarray”. The government’s Brexit deadline is looming but a coherent strategy is yet to emerge, with more focus on internal squabbles than on any real progress. Corbyn hit the nail on the head when he said “the government is so busy negotiating with itself, it cannot negotiate with anybody else”. He called for the Prime Minister to step aside and allow a Labour government, “backed by trade unions and businesses”, to negotiate a deal that protects both UK workers and businesses. The Labour leader posed direct questions; May offered vague, weak answers. Corbyn’s focus on cabinet divisions exposed the Prime Minister as a leader with no grip on her own government, let alone negotiations. As David Lammy tweeted, the Prime Minister appears to be a leader “in office but not in power”.